It struck me, sitting in the Eng library, studiously studying (really, I was!) for my upcoming embedded systems exam that our generation has it harder. That probably sounds exactly the sort of pretentious statement you might expect from a college student of today; so allow me to explain a little further. Computing knowledge and education is dependent on abstraction. As one of my lecturers likes to say (on repeat), computers are very simple and also very complicated. What he means by this paradox is that any layer of a computing system looked at in isolation can be understood without too much trouble: arrange four MOSFETS correctly and you get a NAND gate, hook up a few ANDs, ORs and XORs and you’ve got a full-adder – easy. Similarly, for any budding programmer writing a script to pull some records from a database and display them to a user might seem a logical enough exercise. The complexity is in trying to mentally link these two ends of the computing spectrum: the high level and low level. 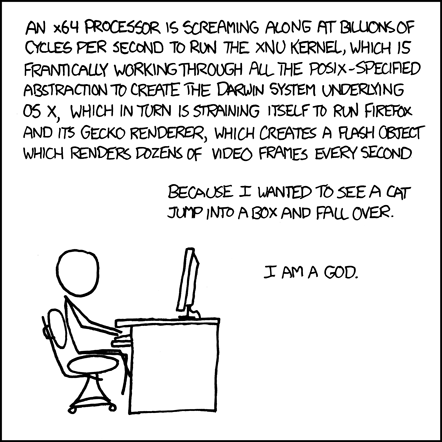 After three years of Computer Engineering courses I’m only just able to go from thinking about some high level bit of functionality and mentally traverse the various layers of abstractions and have some understanding of the machine level functions invoked. One of the books I was studying from, Mano’s, Computer System Architecture, was published in 1983. It continues to remain relevant and useful in 2012. The topics of RISC architectures, control paths and pipelining have evolved only gradually in the intervening 30 odd years. What has evolved is layer upon layer of high level functionality. We’ve had the OO revolution, with many Computer Science students graduating with their lowest level understanding being how to implement quicksort in C#, Java or Python. There are now countless networking protocols, web frameworks, mobile devices, and embedded systems that are starting to look less and less like embedded systems. A consequence of all of these extra layers of abstraction is that students can no longer be expected to learn and understand them all! In recognition of this, there has been a proliferation of new, more specific qualifications. Where we once had Electrical Engineering, we now have Computer Science (the first course was taught in 1953 at the University of Cambridge), Computer Engineering (1971), Software Engineering and Information Technology. Is there any other area of professional education that has seen such an expansion? As a student studying in this new world, I’ve found myself somewhat frustrated that I’m largely expected to learn in detail some narrow area of knowledge. I’ve spent a large amount of my own time trying to understand as much as possible from the other areas of qualification. I’m very aware that to remain current with ever evolving levels of knowledge I will need to continue self-learning throughout my career. So if my generation has it hard trying to make sense of the layers of computing abstractions, it’s both exciting and ominous to think of the complexity that will be encountered by the next generation of computing students.